The last perihelion passage of the Leonid’s parent comet, 55P/Temple-Tuttle, in 1998 is almost two decades ago now. With the knowledge of the dust ejection and trail evolution, variable activity has been modelled and observed in several years. Mikhail Maslov’s calculations indicate a chance for a rather narrow trail of meteroids released from the parent comet in 1300 on November 16 17:07hrUT with a ZHR of about 10 and composed of brighter meteors. 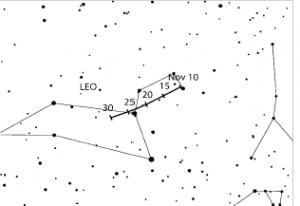 The nodal maximum should occur on Nov. 17th near 16:30 UT. The Leonids occur during a new Moon and the radiant is observable after midnight from southern longitudes.